Natural ingredients: Includes the natural versions of Vitamin B12 (as Methylcobalamin) and Folate (as L-Methylfolate). High-quality manufacturing: Made in a GMP certified facility with long track record of making high-quality products. High potency: Comes with 5000 IU of Vitamin D, which is the highest available on the market. Not 100% whole-food: The fruit and vegetable blend included in the product represents a small part of the total volume of each tablet. Synthetic vitamin A: Vitamin A comes in the form of synthetic beta-carotene. With an Effectiveness Score of 8.8 on a 10 point scale, the Whole-Food Multivitamin Plus by Dr. Mercola is one of the best multivitamins available on the market today and we highly recommend it. How does Dr. Mercola's Whole-Food Multivitamin compare with other multivitamin brands? 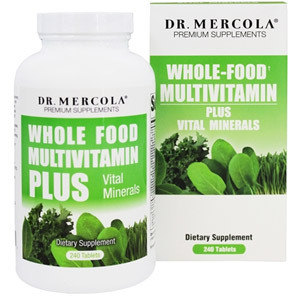 MultivitaminGuide.org offers comparison between the Dr. Mercola Whole-Food Multivitamin Plus and of all major vitamin supplements available on the market. Some of the unique aspects of this guide include comparison of the Dr. Mercola Whole-Food Multivitamin with 100 other vitamin supplement products, including popular brands such as One-A-Day, GNC, Equate, Kirkland, Shaklee, Nature Made, NOW Foods, Melaleuca, Puritan’s Pride, Herbalife, TwinLab, and Walgreens. The table below provides a summary of the Effectiveness Scores of some of the more popular vitamin supplement brands available on the market, including the Dr. Mercola Whole-Food Multivitamin.